In the world of Equestria 21XX, technology is the foundation of equine society. But now robots have seized control and driven the equine population from their cities. What was once a peaceful land filled with technological marvels is now populated with artificial beings that once coexisted with ponykind in harmony. Driven to seek refuge from their metropolitan homes, hope all but seems lost as the few who resist face overwhelming odds. Transported into this alternate universe, Lyra arrives and dons the X armour, taking up her role as the solution to the robotic menace: Megamare X. Aided by the last-remaining guardian of ponykind, Lyra will face familiar villians to make her way inside the protected metropolis of Canterlot and discover the source of the corruption. In order to get home, she will have to battle to the very heart of the protected city, where only danger, loss, and mystery await. This is the upcoming new adventure by the team behind MLP:Online. Megamare X is an homage to the Megaman X series, but set in a world based on the My Little Pony: Friendship is Magic universe. You'll have to jump, shoot, dash, and climb your way through the fast-paced action-platforming world that we have created. Developed from scratch on a completely original game engine (No, it's not a ROM hack!). Run-and-gun gameplay mechanics reminiscent of the original series of Megaman X games. Retro-style game with all-original artwork, music, and creatures. Discover armour upgrades, unlock new weapons, and collect power-ups. 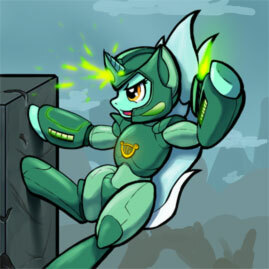 Fight to save an alternate pony world with familiar villains and environments. The game will be released for Windows, Mac, and Linux. The game runs on OpenGL and will be compatible with most systems. Controller play will be supported, with pre-mapped controller configurations for a variety of hardware. The team is completely volunteer-based and always looking for new contributors. Whether you can dedicate your life to serve the robot overlords who compel us to create the game, have some cool art, or just want to tell us how awesomely cool the project is, there are more than a few ways to help out! MegaMare X contains no trademarked material or content. Characters, settings, and symbols depicted are original content or used under fair use. MegaMare X, Cygnus, and Starlight Studios are not associated with the owners, creators, or producers of My Little Pony: Friendship is Magic or Megaman X. No copyright infringement is intended.